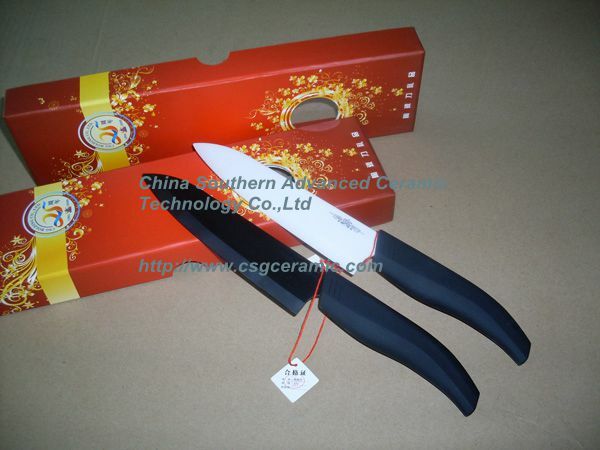 Zirconia Ceramic Knife,CSG00178,Zirconia Ceramic Knife,China Southern Advanced Ceramic Technology Co., Ltd.
Zirconia ceramic Knife is made of high purity material with nanotech, under great pressure of 1500kg/cm2 and high temperature of 1600o C. It is known as” Ceramic Steel” due to more superior hardness and wear resistant than metal. As a high-tech material, Zirconia ceramics is historically utilized in the professional field of aerospace, aviation and oil investigation. ◇　Ultra-sharp Edge. It can amaze you at slicing meat as thin as paper. ◇　High hardness, high resistance to wear. It is as hard as HRA87 while its wear resistance is 60 times of metal knives. ◇　Free from dust. Resistance to corrosion of various acid or alkaline organic substance. ◇　Won't stain, clean easily. It is free-magnetic, completely impact and no porosity. ◇　Keep the food's primary color and flavor. For its chemical stability, it can hardly react with any foods. ◇　Snow-white, pearly and spotless. New era, new material- this green environmental protection concept is fully demonstrated by ceramic knife. It is a new masterpiece made by the advanced technology to the modern society.